Russian authorities hope that a new 210 mile-long toll highway around Moscow will become an important corridor for trade between Europe and China, and will help to improve the traffic situation in the capital. Yet, the road to completion appears filled with obstacles. On the occasion of a meeting on transport infrastructure development in and around Moscow held on August 12, Russian president Vladimir Putin arrived by helicopter. The landing took place near the village of Romashkovo, right on the new Central Ring Road, at the junction with the Minsk highway, where the so-called northern bypass Odintsovo is being rebuilt. The main object of discussion was the Central Ring Road, currently under construction. A project first launched in 2001 in order to relieve the Moscow Ring Road by redirecting traffic flows around Moscow, the road is seen by the authorities as vital for Russia’s economic development. "By 2018, the central ring must become a modern, convenient transportation route, an important portion of inter-regional communication and an international transport corridor," said Putin. The Central Ring Road will be tolled and the permitted speed will be 75-87 miles per hour. Putin advised the authorities be careful when setting the toll rates. "We need to carefully evaluate a fair amount for the toll on the new highway. It should be a sum accessible to all citizens,” recommended the president. The deadline for the completion of the road is set for 2018. Previously works were expected to end in 2020, but materials distributed during the meeting revealed that an acceleration was made possible by the decision to expand the boundaries of Moscow and a ban on the movement of freight transport on the Ring Road in the afternoon. 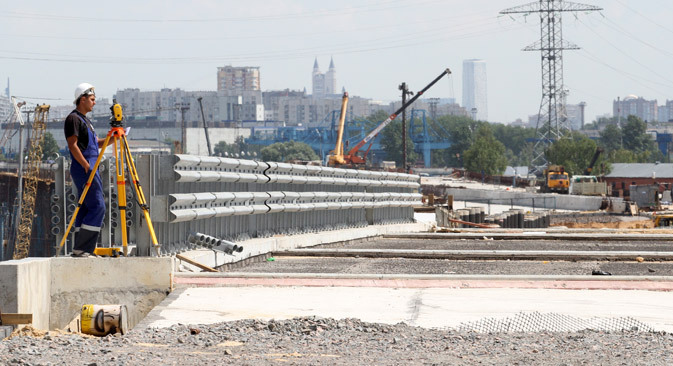 Acting governor of the Moscow region Andrei Vorobyov supported the accelerated construction of the Central Ring Road. Population in the area is growing rapidly, and this increases the load on the trucks. Each year, according to Vorobyov, the region grows by about 250 thousand people. Transport Minister Maxim Sokolov clarified that the Central Ring Road is estimated to be 210 mile-long. Of these, 180 miles will be built from scratch, while the rest will involve the renovation of a previously existing smaller ring (known as “betonka” in Russian). After 2020, the construction of the Central Ring Road will continue and it will be part of a pan-European backbone of Europe cutting across London and Paris, and leading to the western part of China. By 2020, $9 billion are expected to be spent on the project. Of these, $4.5 billion will be provided by the National Welfare Fund, $2.2 billion taken from the state budget and $2.3billion obtained via private investment. As Sergei Kelbah, chairman of the Federal Highway Agency of Ministry of Transport of the Russian Federation (Rosavtodor), explained to Russian online newspaper Gazeta.ru, the National Welfare Fund’s money will come in the form of corporate bonds from state-owned company Avtodor, with a return that will amount to inflation rate plus 1 percent. According to Andrey Verkholantsev, head of the analytical department of the Operating Company "Kapital", this provision aims at attracting investors. Meanwhile, rumours of speculation and fraud in the process of acquisition of land from the local residents are tainting the construction process. In the early 2000s the land in the Central Ring Road area was reserved and defined as a corridor within which sale and resale were limited. Yet, some caught the occasion to speculate and buy land with the complicity of local authorities. Informed of the situation, Putin brought attention to the issue and condemned the practice. “I do not think that now that Putin has spoken publicly about liability for those who circumvent the law on the reservation land for large projects twice someone would have any desire to organize a corruption schemes," says Pavel Gagarin, chairman of the board of directors of audit and consulting group Gradient Alpha. Other problems with the re-acquisition concern the price at which land is been purchased. Acting Mayor of Moscow Sergei Sobyanin, who participated in the meeting on the development of transport infrastructure in and around Moscow, assured Putin that conflicts with the population should not arise, as the land will be purchased at market value. "In any case, for the reacquisition of residential and commercial properties a commercial evaluation is conducted first," he said. However, Gazeta.Ru learned that some of the owners of the land in question are already filing lawsuits against the government because of ostensibly unfair land evaluation. According to Gagarin, the situation with the construction of the Central Ring Road presents some similarities with the one in Sochi with the purchase of land for the construction of facilities for the Winter Olympics scheduled for 2014. In both cases the authorities implemented a major infrastructure project with the removal of land from private owners. "But the parallels end here. The cost of the land on the coast of Sochi, with a few exceptions, is much higher than in the districts of the Moscow region through which the Central Ring Road will pass," he says. Some commentators believe that political motifs might be behind the acceleration in the construction. "No one says it out loud, but it's an obvious reason. When the current president holds a meeting on infrastructure issues, he is de facto showing his support for the acting heads of Moscow and the Moscow region ahead of the mayoral elections. Also, it should be noted that in 2018 a new presidential campaign will begin," says Igor Nikolayev, a partner at financial and management consulting company FBK. According to Nikolayev, building the Central Ring Road in the stated period is not feasible. "Projections were made was at a time when there was at least a little economic growth. Russia now is on the verge of a recession, revenues have decreased, and the authorities will soon have to make a choice between continuing to spend money on the majestic projects like this and taking care of important social issues," he says.